In our February edition of our Preemie Family newsletter we learned about the handsome miracle Jack Ryan Lesoine, a 28-weeker who was 2 lbs. 1 oz. at birth and spent 112 days in the NICU. Read more in an update by his mother, Heather. . . Does it count as giving birth when I didn’t “give” anything? Something, many things, were taken from me and from my son, and my husband too. From my entire family, if you really think about it. Jack was taken from me too soon, my 3rd trimester was taken, my ideal birth, my hope for a healthy child and let us not forget that Jack’s chance at a healthy start to life…gone. All taken…even the little, trivial things, like being pregnant at my own baby shower, birth announcements, that first bonding moment, meeting the family, getting fat & uncomfortable as my due date neared. Yes, one might think that I escaped that uncomfortable third trimester. But I beg to differ, because I did suffer through my third trimester…staring at my son through isolette walls, waiting for 11 days to hold him, leaving him with strangers every day, and wondering every day if he would live to see the next…and unlike a normal fetus who grows and thrives in the third trimester, my fetus, my boy…suffered and was forced to develop in an unnatural environment. All because my body could not handle being pregnant any longer. Looking back, I now know that my body was telling my mind that something was not right. Just a few days before I was admitted, I had a dark thought and wondered to myself, “What if I really don’t want a baby?” I had been thinking about all the things we’d miss out on and the difficulty in raising children these days. My mind was telling me to get ready, because I was going to soon know just how much I really wanted that baby. My baby boy. I have a voicemail that I save…I have been saving it since August 13, 2010, just three day into Jack’s little life. It’s not the usual congratulatory message one receives when giving birth (there’s that word “giving” again), but it’s been saved anyway. Don’t get me wrong, many people offered up congratulations in a not so joyous time. And I’m glad. If they hadn’t, I would have been hurt. But this voicemail, from a friend, my best friend, was exactly what I needed to hear then and what I still need to hear, over 2 years later. My friend called to check on me, to see how I was feeling and gave me the very thing I needed to hear…that this was not what we had planned and things did not go as they should have. That acknowledgement still brings tears to my eyes now, as I’m writing, as it did the first day I’ve heard it. Since that day, I’ve been wrestling with the lack of acknowledgement that is given to the very real, and very unpleasant, experiences that come with preeclampsia and prematurity. Both are often downplayed and glossed over. Throughout the past year I’ve learned many things about both conditions and the most startling fact that I learned is that too many are uninformed and uneducated about the 2 P’s. It is my hope that with Jack’s story, more people will be willing to acknowledge what prematurity can do to an infant and his family. I had entered the hospital 28 weeks, 2 days pregnant with severe preeclampsia. We were told that delivery of our baby boy was imminent and that we would need to transfer to a hospital that could care for such an early, sick baby. On the same day that we chose a name for our baby boy, we were also told that it might not be possible to save both of us. I have to say that I was completely unaware of what being born prematurely entailed, but I feared for my own life and definitely mentioned that “I didn’t want to die” to my family. Jack entered the world at 10:12pm on August 10, 2010 with a little cry and a “Hello, Jack” from the surgeons. Before I could even see him, he was whisked away to the NICU. I was unable to see him for over 24 hours, but my husband had reported that he was looking good and very small. He weighed 938 grams or 2 pounds 1 oz and measured 12.5 inches. Seeing him for the first time was awful and awesome at the same time. He was so perfect, yet so very, very tiny. His nurse gave me one of the tiniest diapers I had ever seen and I kept that diaper with me for a long time. Any expectations that we had about pregnancy, childbirth and parenting had just been thrown out the window. Our son’s first home was a hospital NICU and his first bed was an isolette. We weren’t able to hold him in our arms until 11 days after his arrival, and even then we could only hold him when he was stable enough to do so. 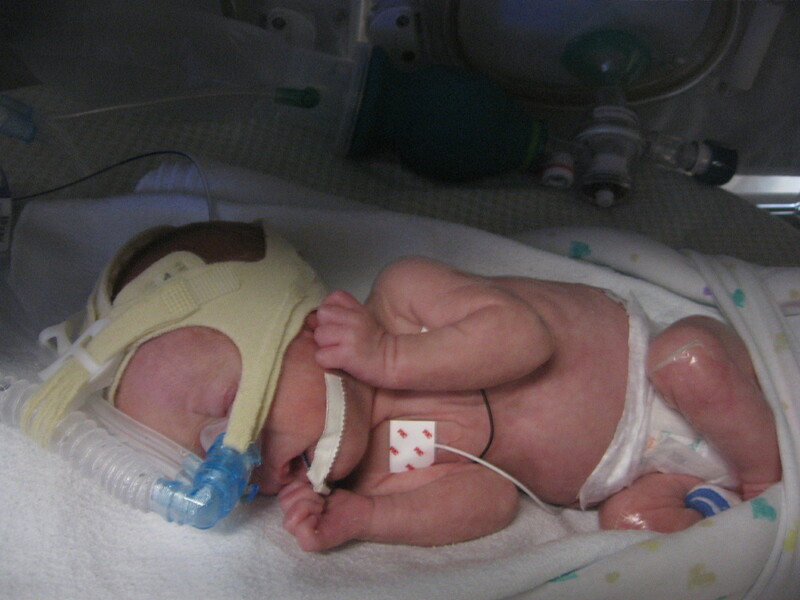 Prematurity wreaks havoc on a little baby’s body and on his parents. Jack was struggling to breath and was fighting for his life, something no innocent newborn should have to do. 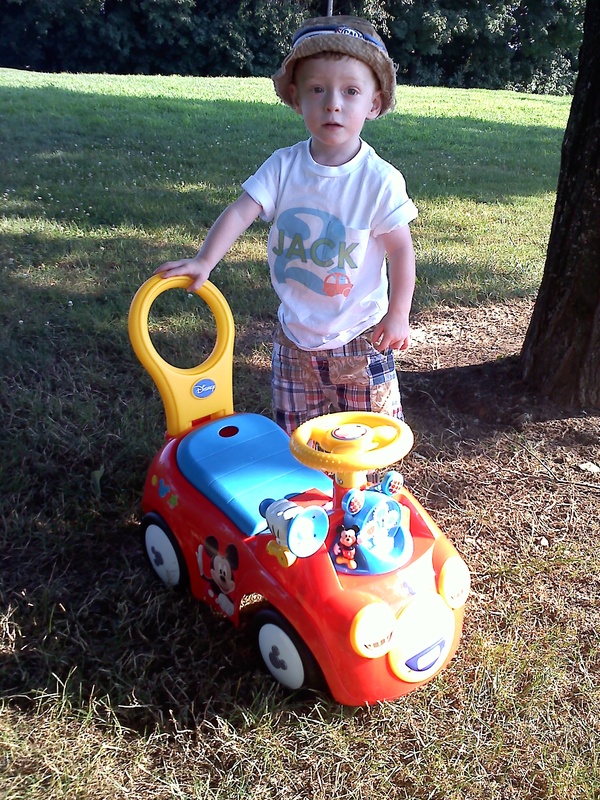 We were thrown into a world of apneas and bradys, TPN and C-PAP, and the notorious BPD (Bronchopulmonary Dysplasia) – Jack’s major diagnosis for his immature and damaged lungs. 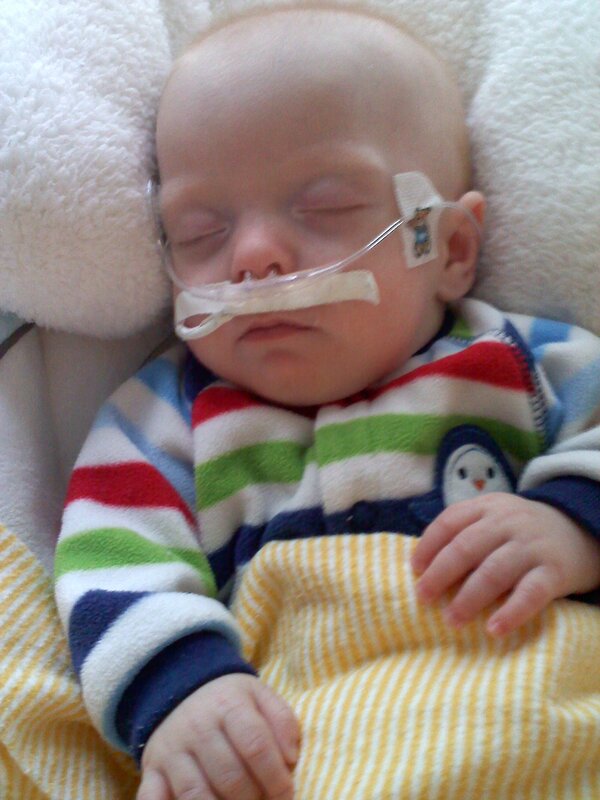 Jeff and I began spending all of our spare time with Jack in the NICU, wondering every day if he would survive. He spent almost 2 weeks on a ventilator (oscillator), then months on C-PAP, Si-Pap, and Vapotherm and finally nasal cannula. We were not prepared for all of the dangers of prematurity, such as brain injuries, blindness, and lung disease. I naively thought, as many do, that premature babies just need to gain weight and go home. I quickly learned that I was sadly mistaken. 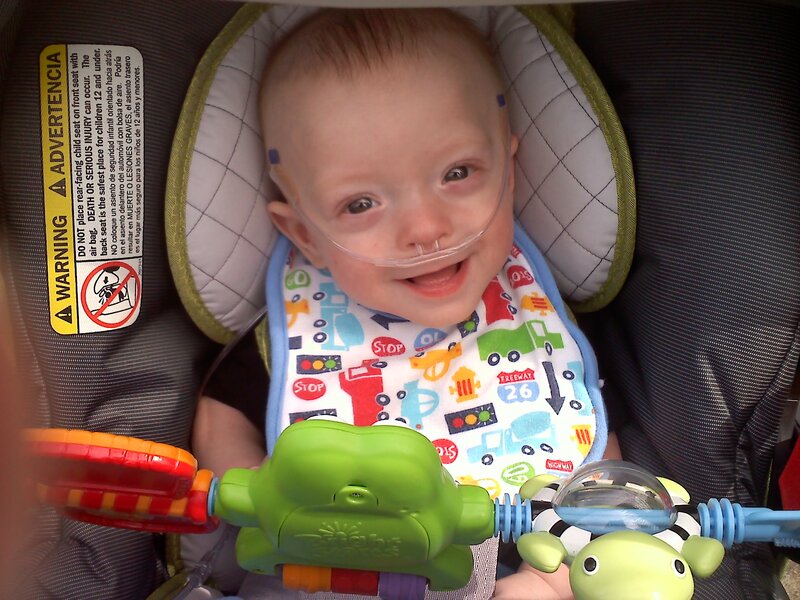 Throughout Jack’s 112 day stay, he was cared for by amazing doctors, nurses and therapists. Some of them are even like family to us still, two years later. Yet, I always have trouble answering when someone asks what our NICU experience was like, because I have conflicting views. For the most part, it was awful to have to watch our little boy struggle to breathe, struggle to eat, struggle to survive and to have to leave him, over and over again, for 112 days. But, knowing that he was being cared for by an exceptional NICU staff helped lessen some of our anxieties and fears. After a 112 day stay, we left the NICU with our definition of miracle. Babies at Jack’s low birth weight and early gestation don’t always have the best outcome. We were blessed that Jack only had one surgery (for inguinal hernias) and didn’t seem to suffer from some of the more severe preemie issues (NEC, ROP, PDA surgery). Unfortunately, we soon realized that prematurity does not end when one leaves the NICU. Because of his lung disease, Jack came home on 24-hour O2 support and a feeding (NG) tube and many medications, along with multiple doctor and therapy appointments. Basically, the hospital came home with us (without those awesome nurses and doctors). It was completely and utterly overwhelming and exhausting. The worst, for me as his mom, was being unable to feed him and give him nourishment “naturally,” from the breast or bottle. I did pump for 4 months (which gave Jack breast milk for almost 6 months), but I was too stressed to keep up with the pumping when he came home. The feeding tube kept him well-fed and plump, but made me so anxious that he would never eat normally. Jack eventually no longer needed the feeding tube (at 8 months) or the 02 support (at 10 months). Because his lungs are still fragile, we take extra care to keep our miracle boy healthy and we are vigilant about his nutrition as well. It’s been a long, emotional, exhausting, and amazing journey. Jack is now 28 months old and has been healing from his early arrival with the help of many doctors, specialists, and therapists (OT, PT, ST), and of course the love of his parents and family. 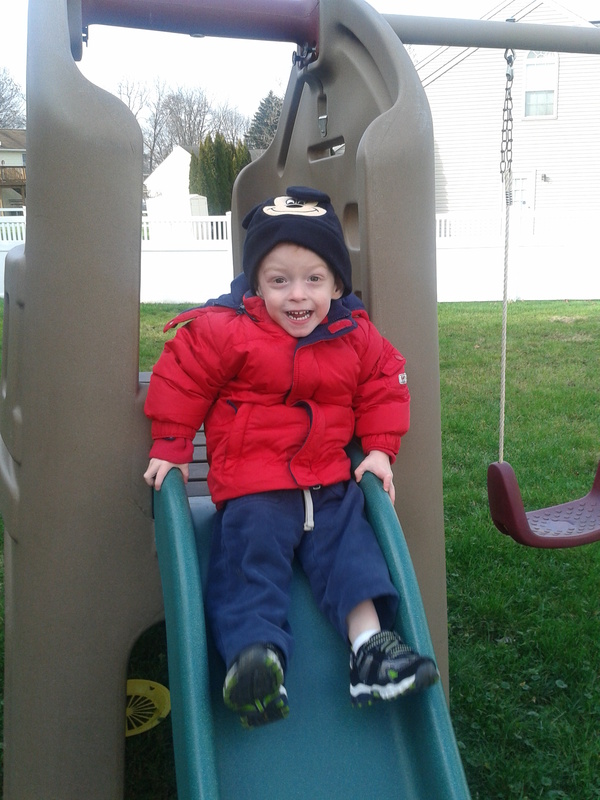 He loves to run and play, trucks and trains, read books, swim, watch Disney Jr. and eat anything that involves cheese. He recently started to use words instead of signs too! But, most of all, he is happy! And it is my great hope, that the “healthy” will come. All pictures courtesy of Heather Lesoine. I am jack Lesoine. Thank you for writing an article about me.I am now 8 years old.